In stock -This product will ship today if ordered within the next 6 hours and 37 minutes. 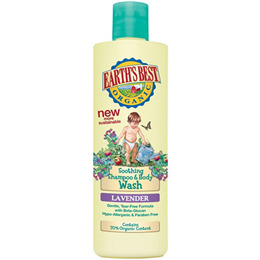 Jason Earth`s Best Soothing Shampoo & Body Wash is an ever-so-gentle, tear-free, 2-in-1 formula. It cleanses baby`s delicate skin and hair during bath time, leaving both soft and clean. Lightly scented with calming lavender, this hypo-allergenic, non-irritating wash contains special ingredients like beta-glucan for hydration, chamomile to relieve dryness and marigold (calendula) to soothe irritation. It`s the perfect formula for bathing at naptime, nighttime or anytime! Aloe Barbadensis Leaf Juice(1), Aqua (Water), Decyl Glucoside, Sodium Coco-Sulfate, Sodium Chloride, Glycerin, Lauryl Lactyl Lactate, Arnica Montana Flower Extract(1), Avena Sativa (Oat) Bran(1), Calendula Officinalis Flower Extract(1) Camellia Sinensis Leaf Extract(1), Chamomilla Recutita (Matricaria) Flower Extract(1), Lavandula Angustifolia (Lavender) Flower Extract(1), Citrus Aurantifolia (Lime) Oil, Citrus Limon (Lemon) Peel Oil, Lavandula Angustifolia (Lavender) Oil, Helianthus Annuus (Sunflower) Seed Oil(1), Beta-Glucan(1), Citric Acid, Sodium Sulfate, Alcohol(1), Potassium Sorbate, Sodium Benzoate, Linalool. Wet baby`s hair and body with warm water. 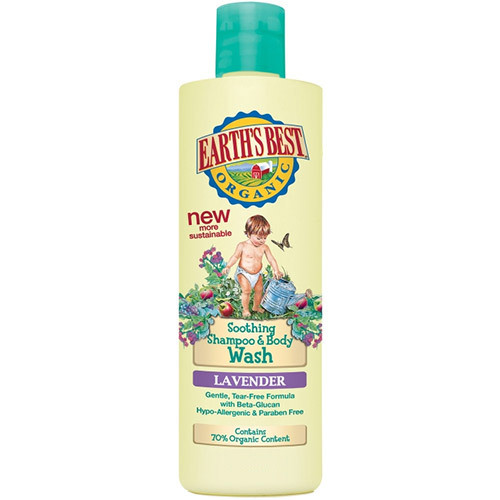 Pour a moderate amount into your hand or wash cloth and gently wash baby`s hair and skin. Rinse thoroughly after use. Children use under adult supervision. Below are reviews of Jason Earth`s Best Soothing Shampoo & Body Wash - 251ml by bodykind customers. If you have tried this product we'd love to hear what you think so please leave a review. Works very well, doesn't hurt the baby's eye.